Have you ever thought that how we can judge whether the two people are similar or not, or in a group which two have highest similarity? If yes, then here is the answer. Let us understand it with an example, consider there is a group of four people and corresponding to each of them we have some data, in our case we have some ratings provided by them for some fruits, 5 means best and 0 means worst. 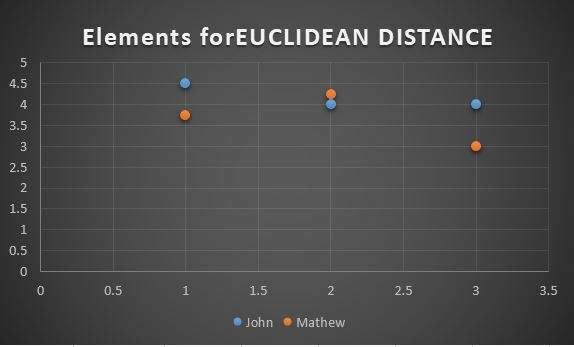 Now, if we want to compare John with Mathew, we can simply calculate the Euclidean Distance between the ratings they have provided corresponding to same item. Here Mango, Strawberry and Pineapple are the fruits which are common for both of them. Consider the rating corresponding each fruit be the distance elements. Lower the distance higher is the similarity. This formula helps in calculating the Euclidean Distance, where ‘n’ is the total number of elements, ‘x’ and ‘y’ are the two distance elements. For our example it comes out to be 0.439607805437114. ‘Result’ value always lies between 0 and 1, the value 1 corresponds to highest similarity. #Value 1 is added to sqrt to prevent 1/0 division and to normaloze result. There are many other mathematical models for calculating this type of similarity. In next article we will learn about Pearson Correlation Score, which is a bit complex way for finding out similarity among people. Stay tuned and keep learning!! For more updates and news related to this blog as well as to data science, machine learning and data visualization, please follow our facebook page by clicking this link.